How to take a screenshot on a Mac, how to print screen on Mac, taking screenshot of the Entire Screen, a part of the screen or certain window. If you want to show your friend an interesting moment on your screen, present a snapshot of your project to your lecturer, show an expert the error message you receive on your computer, or to display an instruction of how to use a software on your website, screenshot or print screen is the perfect way to show exactly what happen on your computer screen. Print screen or taking a screenshot on a Mac is pretty simple in Mac OS X. In Mac, you can flexibly take a screenshot of your whole screen, a part of your screen, a window, menu or anything in any way you want. These are all built-in features in Mac (Macbook Pro, Macbook Air and other Mac) by default which means you don’t have to install anything to make this happen. Print screen can be done easily by pressing certain shortcut keys on your Mac keyboard (which we will explain about it later). Different shortcut key (based on your preference) will result in a different way in taking screenshot on Mac. The file will ultimately be saved onto your desktop as an PNG file. We have listed all the Mac screenshot and print screen methods, instructions and shortcut keys below. Choose a method that best suit your need to take a screenshot on Mac. 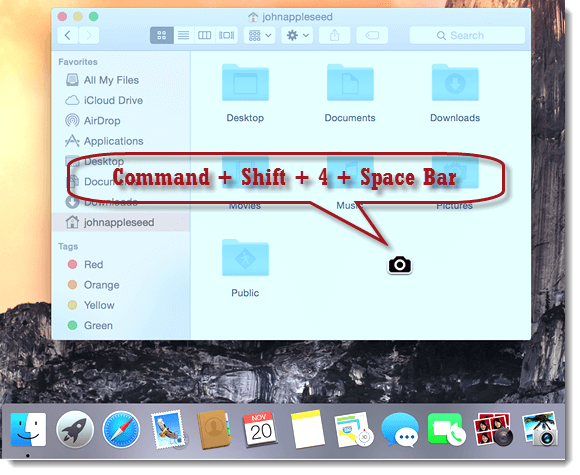 If you want to take a screenshot of the whole screen of your Mac, press and hold Command, Shift and then 3. It won’t work if you press them one by one. You will need to press and hold the Command key, and then the Shift key without releasing the Command key, and finally the 3 key without releasing the 2 keys you’ve been holding earlier. If you want to take a screenshot of only a part of your current screen, press and hold Command + Shift + 4. This will change your mouse pointer to a crosshair. While holding your mouse button, drag your pointer and highlight any part or area of your screen that you want to print screen. While dragging, you can try holding Shift, Option or Space bar key for different types of selection. When you’ve done highlighting the area you wish to take a screenshot from, release your mouse button. Screenshot will then be saved on your desktop as an PNG image file. If you want to take a screenshot of a certain Window perfectly without having to manually highlighting using the crosshair, press Command + Shift + 4. And then press the space bar key which will then change the pointer into a camera. This pointer will automatically detect the window you are currently pointing at and when you click on it, it will take a screenshot of the selected window. Screenshot will be saved as an PNG file on your Mac desktop. If you don’t need a file and would like to save your screenshot in the clipboard and paste it somewhere else, say like an image editor, you can do so by holding the Control key followed by one of the above shortcut keys combination. For example, to take screenshot of your entire screen to the clipboard, hold Command + Shift + Control + 3 and paste it to anywhere you like by holding and pressing Command + V.
Command + Shift + Control + 3/4 to copy, Command + V to paste. Other than using the built-in Mac print screen tools, you can also download and use some of the most popular third party screen capture tools and programs to print screen on Mac. These tools offer wider range of screenshot options and flexibility. Most would come with an image editor to edit, highlight, input details, drawing circles or adding whatever you want on your newly taken screenshots. You may want to check out Skitch, WebClipper, SharpShooter, Captur, Jing and Snagit Editor. These mentioned screenshot capture tools for Mac are the most widely used and the most recommended for designers.